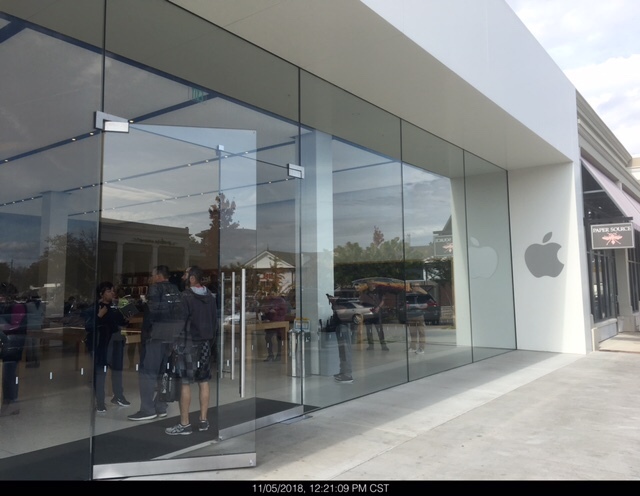 So I go to the Saddle Creek Apple Store in Germantown, Tennessee. My intent was to replace the worn out battery in my 6s Plus I received on launch day September 25, 2015. It was at 68% battery life, and I wanted to take advantage of the $29.99 deal. And hoped they would keep my phone on iOS 10.1.1 for the 32 bit apps I use. I get there shortly before my 1:00 reservation. The lady who first spoke with me was not very friendly. No smile, to the point, and hurried. All my info was gathered and was told to come back 2 hours later to pick up my iPhone. When I return, I'm given my iPhone and it looks good. New battery and still on iOS 10.1.1. So I leave as a big storm is rolling through. Mostly a torrential downpour. As we're going along, I try to capture a photo of the rain, but the camera shows a black screen and the LED torch doesn't work at all. So we turn around and go back, where I'm told they'll just replace the phone. But I didn't want that. A replacement would not be on iOS 10.1.1. So they say they'll try to repair it, and to come back an hour and a half later. So I go back, but am told it could not be repaired. Instead, they give me a brand new 6s Plus. At this point, I was angry with the whole thing. I really wanted to keep those 32 bit apps. As it turned out, the "no smiles" lady was from my hometown in Alabama and was actually nice and concerned. I end up with a brand new 6s Plus (not a refurb) with a battery life of 101%. It came with iOS 11.2. I'll update it to 12.1 soon. It wasn't what I initially wanted, but the Plus side keeps getting heavier. The old 6s Plus was down to under 5 gb of storage available. I was struggling to keep it there. The new 6s Plus has all the same stuff, as I set it up with my iCloud back up. But it has 43.7 gb of available storage. I knew the old one had a lot of cached files and "other" on it, but no idea it was that much. I didn't get much chance to browse, as the store was packed and my son was waiting in the car. But I did get a look at the XR. The screen looked fantastic on it. I never saw the Max. The store was just too crowded. I think the Memphis area needs more than one store. Annie_8plus, joemd60, cwbcpa and 6 others like this. I’m glad everything worked out for you, even if you couldn’t keep your 32 bit apps. Thanks for sharing your experience with us. Ledsteplin, joemd60, Spencerdl and 1 others like this. A brand new iPhone for $30?? That’s awesome. Enjoy it. Sorry to hear everything didn't go as planned, but you did get a brand new phone out of it. That's still good. libra89, Ledsteplin and Spencerdl like this. libra89, Spencerdl and Ledsteplin like this. Glad you got everything taken care of. My wife had one of those new phone experiences when a simple repair didn’t work. Sure there was some frustration over time spent and that restore plus reconfigure but overall good for a used phone. There’s an Apple Store 2 blocks from the HQ office where I work and one of our own store and cafe locations so I see a lot of traffic related to it plus our staff goes there. We get business team treatment. There are always some less than ideal experiences and we’ve had them but I see the honest stats of many experiences there and usually wish other players did as good a job. There are some certified and highly qualified independent stores too. They offer same warranty and repair experiences but the ones I’ve been to never have the same inventory. They are worth considering. Yep. And I've found a way to compensate for the main 32 bit app I wanted to keep, thanks to iOS 12 and Shortcuts. ladyc0524, Spencerdl, Annie_8plus and 1 others like this. If you ever wonder why some Apple employees are less than enthusiastic about their jobs, search Apple salaries. I was a little surprised at what I found. We’ve been telling you for centuries now to upgrade. I'm so glad it worked out for you! I for one am very glad that you're on 12.1 now and using Shortcuts!!!! That's great! Also, you should get a survey from Apple if you haven't already. This is a good opportunity to share feedback about your experience at their store. Tartarus, ladyc0524, Ledsteplin and 1 others like this. Yeah, but still other 32 bit apps that Shortcuts don't help. I hear there are 3 new iPhones to choose from this year.